Heraldry: It’s Everywhere! It’s Everywhere! Anyway, someone else in the elevator was going to the sixth floor, and when the doors opened there for them to leave, I noticed a new office (so new that their number plate is a hand-lettered half sheet of paper) that had a framed grant of arms hanging on the wall in their reception area. So, of course, I did a quick double-take before the doors closed, since I just wasn’t expecting to see a grant of arms hanging up in the building where I work. And then made a mental note to myself to bring my camera to work and go down and ask if I might take some photographs. 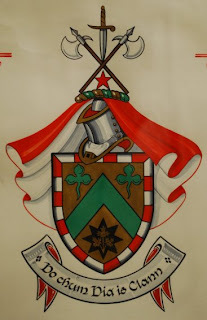 Mr. Corrigan has been very involved in researching his own genealogy and, from some of the entries I’ve seen by him or acknowledging his assistance, in helping others with their own genealogy on lines related to his. 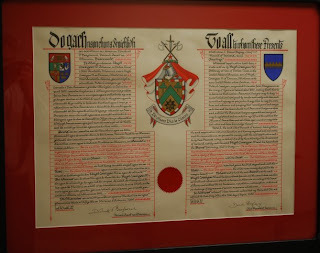 It was apparently after his having done a fair bit of this research that he decided to apply to the Chief Herald of Ireland for a grant of arms. And, of course, to pass along to his family. But, my goodness, what a great thing to find on the way to work one day. It just goes to show once again that you can find heraldry everywhere.